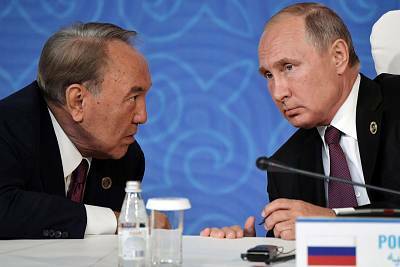 MOSCOW — As soon as Kazakhstan's Nursultan Nazarbayev announced he was stepping down last week, speculation began swirling that a fellow strongman across the border might follow his lead: Russia's Vladimir Putin. Like Putin, Nazarbayev — the post-Soviet world's longest-serving leader — has clamped down on dissent and exerted heavy-handed control of society while maintaining a semblance of democracy by holding elections, the last of which, in 2015, Nazarbayev won re-election with nearly 98 percent of the vote. Nazarbayev, 78, also helped steer his vast oil-rich Central Asian nation through the turbulent years that followed the breakup of the U.S.S.R. But also like Putin, Nazarbayev does not show signs that he is ready to actually relinquish power. "It could indeed be a model for Putin, and this is by no means the first time this subject has come up," Zach Witlin, a senior analyst at the political consultancy Eurasia Group, said. "It says something about Russia and the entire post-Soviet space that Putin and other leaders are approaching the succession trap," he added, referring to countries that do not have clear plans for transferring power. Although Nazarbayev resigned from the presidency, he still holds the title "Leader of the Nation" and will stay on as the head of the ruling party and of the Security Council, a lifetime position. "As the founder of the independent Kazakh state I see my task now in facilitating the rise of a new generation of leaders who will continue the reforms that are underway in the country," he said in a nationally televised address announcing his resignation. On March 20, former Prime Minister Kassym-Jomart Tokayev was sworn in as the interim president, at lesat until the next election, which is slated for 2020. Tokayev immediately proposed renaming the country's capital from Astana to Nursultan, Nazarbayev's first name. Nazarbayev's daughter, Dariga, was elected Senate speaker — a role that had just been vacated by Tokayev. So much for fundamental change, then. "Nazarbayev will continue to rule Kazakhstan as the elder statesman behind the throne," according to Kate Mallinson, an associate fellow at the London-based think tank Chatham House. "Nazarbayev's resignation does not signal any immediate major policy shifts as the real power transition is yet to come and Kazakhstan's first president will be well-positioned to oversee it." Nazarbayev has managed to step down as president without relinquishing influence, drawing comparisons to other world leaders who have done the same, such as Singapore's Lee Kwan Yew. That's something Putin could well want to emulate, said Alexander Gabuev, a senior fellow at the Carnegie Moscow Center, a think tank. "Borrowing some pages from Nazarbayev might be handy," he said. "I think there will be a strong temptation for Mr. Putin to indicate at least some of his moves." But not everybody believes that Putin will borrow any pages from Nazarbayev's playbook. "When people ask if Putin will follow the example of Nazarbayev, I say, 'Can you imagine Vladimir Putin copying anyone's example?" Arkady Dubnov, a Russian political expert and journalist, told Echo of Moscow radio station. "He can only come up with his own way — and just that, I think, makes it impossible. He can't be a copier by definition." Putin usually evades directly answering questions about what he plans to do when his fourth term ends in 2024, although he has said he won't be president until he is "100 years old." The Russian Constitution bars him from running for a third consecutive term. There are differences between the two leaders, however. While Nazarbayev has been in power since 1989 — before the end of the Soviet Union — Putin came to power nearly a decade after its collapse. Since then, Russia has pursued a number of foreign policies, including in Ukraine and Syria, that have put Putin at odds with the U.S. and the West. In contrast, Nazarbayev has had to balance good relations with his country's two large neighbors, Russia and China, as well as the U.S. In a move away from the country's Soviet past, he also pushed for a switch to a Latin-based alphabet from a Cyrillic one. 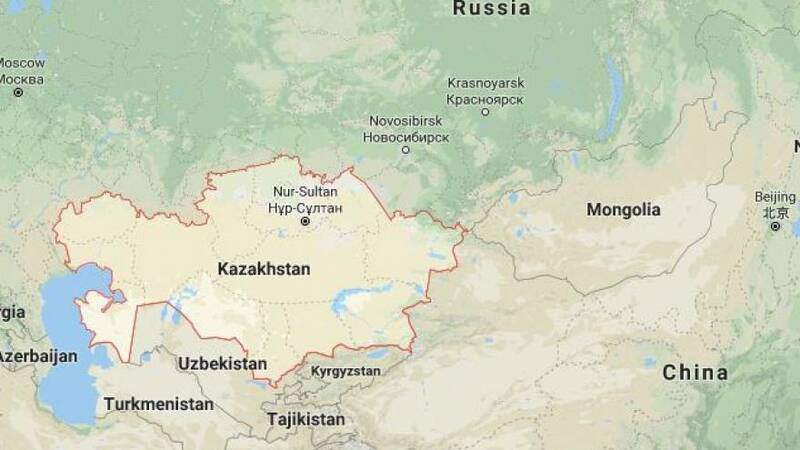 Other countries in the region will be closely watching Nazarbayev's transition, especially as fellow Central Asian leaders have either died in office or been pushed out by revolutions in recent years. In 2016, Uzbekistan's repressive leader, Islam Karimov, died, leaving his country and family without a clear succession plan. For Nazarbayev to avoid the same fate as Karimov, analysts said, he needed to start the transition while he is still alive. As a result, he has orchestrated a multistep managed transition over the last two and half years — something Putin is surely keeping an eye on. "Kazakhstan's Nazarbayev is not stepping down, he is stepping up," Dmitri Trenin, the director of the Carnegie Moscow Center, wrote in a Twitter post. "He will oversee power transit over the next few years. A version of this model of 'president mentor,' copyrights in Singapore by Lee Kwan Yew, is also likely to be used in due course in Russia by Vladimir Putin."